The rumor mills are busy churning details about the upcoming HTC event on October 8 wherein it is expected that the Taiwan based vendor will be showcasing a smartphone and a rugged GoPro-like camera. 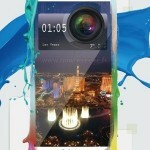 The anticipated smartphone is likely to have been leaked in a press render that hit the web with the moniker HTC M8 Eye. 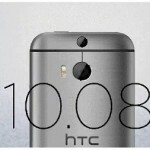 The alleged press render image of the speculated HTC M8 Eye smartphone has come in from the Chinese social network Weibo by a user named Gsmdome. 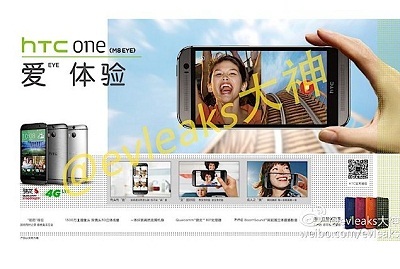 The image suggests that the anticipated smartphone will resemble the flagship HTC One M8 largely in terms of design. The M8 Eye is also likely to feature a Duo Camera setup as in the flagship smartphone launched by the vendor earlier this year. However, it is claimed to incorporate a 13 MP primary camera rather than the UltraPixel sensor alongside the depth sensor. Last week, a media report claimed that the vendor might introduce the M8 Eye smartphone with a 13 MP rear camera paired with the duo camera technology adding more authenticity this feature. LlabTooFer posted a tweet with the information and also mentioned that the device will run Android 4.4.4 KitKat out of the box topped with the latest Sense 6.0 UI. Previous reports have suggested the use of a 5.2-inch full HD display with 1920×1080 pixels and a Qualcomm Snapdragon 801 SoC under its hood. There are speculations claiming that the smartphone will feature similar specifications as the HTC One M8. Recent media reports also suggested that the Taiwanese giant will announce a GoPro-like rugged waterproof camera called RECamera. 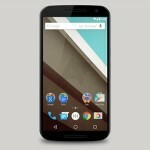 The report also includes some leaked images of the upcoming device along with other details. 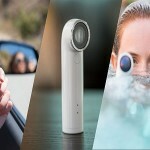 The Taiwanese giant in a tweet from an all new RECamera Twitter account confirmed that a camera like device will be revealed at HTC’s ‘Double Exposure’ media event slated to happen on October 8 in New York.